Himalayan Fritillary Himalayan Fritillary is a perennial herb found high in the Himalayas. Stems are 15-60 cm tall. Oppositely arranged leaves, 7-11 in number, are sometimes also 3- or 4-whorled and alternate. Leaves are linear to linear- lanceshaped, 4-12 cm long, 3-5 mm wide, with the tip often curved or coiled. Flowers are borne in groups of 1-3, subtended by 3 leaflike bracts. Flower are yellow, nodding, bell-shaped. Flower stalk is much shorter than the tepals. Tepals are yellowish-green to to brownish-purple, slightly or heavily spotted with purple, usually oblong-elliptic, 3-5 × 1.2-1.8 cm. Stamens are 2-3 cm long; style is 3-lobed. Capsule is narrowly winged. 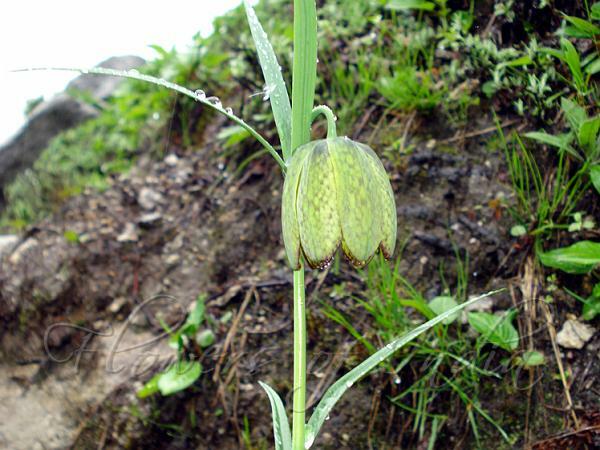 Yellow Himalayan Fritillary is found in alpine thickets, meadows, flood lands and moist places in the Himalayas, at altitudes of 3200-4600 m, in NE India. Flowering: May-July. 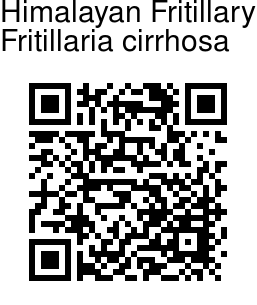 Medicinal uses: The bulb is supposedly antiasthmatic, antirheumatic, febrifuge, galactogogue, haemostatic, ophthalmic and oxytocic. It is boiled with orange peel and used in the treatment of TB and asthma. Identification credit: Pankaj Kumar Photographed at Rohtang Pass, Himachal Pradesh & Gulmarg, Kashmir.